Create insightful management reporting with the minimum of fuss, enhanced with drill-down, trends and variance analysis. Dynamic integration with Excel makes report design, authoring and distribution a breeze. You have complete control over the layout and presentation of your data. Streamline your process with direct feeds of data from multiple data sources into a standardised structure, ensuring consistency and one version of the truth. The multi-dimensional database lets you quickly and easily slice your data across business units, divisions, departments, products and time periods. Replace large multi-tabbed workbooks with fewer simpler report templates, dynamically linked to the database and so always up to date. All your management and financial reporting needs can be catered for in one model. All reports, dashboards and scorecards come from one source showing one agreed version of the truth. 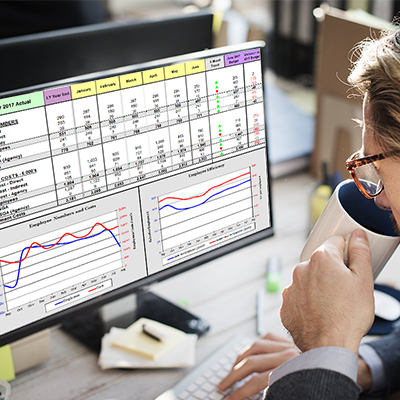 Exploit the wealth of Excel knowledge you already have, along with the bespoke Cubix functions to produce informative and relevant reports just the way you want them. Reports can be truly dynamic and interactive. Include selection options to allow quick and simple changes of report content. View and explore data in a pivot type format. Slice and Dice your model and add filters to focus on the view that is important for you. Double click on any calculated or consolidated figure to drill down to underlying values or across to equivalent data from a different time period or version. Calculations are applied consistently and precisely across the whole model. They are internal to the model design so no risk of users making unsanctioned or unintentional changes. Include commentary and text against any value in the model. Recall the commentary in reports or as part of a browser. View and report data in the originating local currency or any defined group currency.